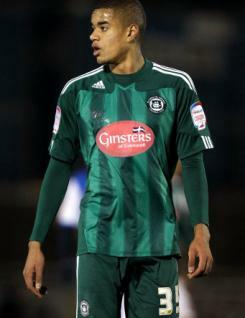 Curtis Nelson was in his first year as a professional with Plymouth Argyle in 2010-11. A strong tackling centre back who can also play as a defensive midfielder, he proved to be one of the brightest features of an otherwise disappointing campaign for Argyle. Curtis made his senior debut when coming off the bench in the Carling Cup tie with Notts County in August and quickly went on to establish himself as a regular in the side, starting in over 30 League One games. To cap a fine season he made his debut for England at U18 level and was selected as Argyle?s Young Player of the Year. Curtis was previously attached to the Stoke City Academy before joining Plymouth.